A ruminant is any even-toed, hooved mammal (order Artiodactyla) that digests its food in two steps, first by softening it within the animal's first stomach, known as the rumen, then regurgitating the semi-digested mass, now known as cud, and chewing it again. Most ungulates have a four-chambered stomach (camelids have three chambers), lack upper incisors (camelids have an upper incisor), and have two-toed feet (chevrotains have four toes). Among ruminating mammals are cattle, goats, sheep, giraffes, American Bison, European bison, yaks, water buffalo, deer, camels, alpacas, llamas, wildebeest, antelope, pronghorn, and nilgai. Taxonomically, the suborder Ruminantia includes all those species except the camelids (camels, llamas, alpacas, etc. ), which are in Tylopoda. Therefore, the term "ruminant" is not synonymous with Ruminantia. The process of again chewing the cud to further break down plant matter and stimulate digestion is called "ruminating." Rumination involves a symbiotic relationship between ruminants and many microbes in their digestive tract. Through producing cellulases, the microbes are able to digest dietary cellulose, the primary structural component of green plants, and other plant wall materials. In the process, the ruminants are able to obtain some of the end products of this fermentation for their own use, such as various fatty acids. The microbes receive a habitat and a food source, while the ruminant benefits from being able to digest the most abundant organic (carbon-containing) compound on Earth (cellulose). The verb to ruminate also has been extended metaphorically to mean to thoughtfully ponder or to meditate on some topic. Similarly, ideas may be chewed on or digested. Chew the (one's) cud is to reflect or meditate. Ruminants belong to the order Artiodactyla. Known as even-toed ungulates, the axis of the leg passes between the third and fourth toes. 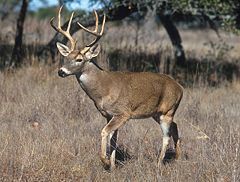 The weight of most even-toed ungulates is born evenly on the third and fourth toe of each foot with the other toes being absent, or vestigial in the case of most deer. Except for hippopotamuses, peccaries, and pigs, all even-toed ungulates digest their food by the process of rumination. Most ruminants belong to the suborder Ruminantia. Extant members of this suborder include the families Tragulidae (chevrotains), Moschidae (musk deer), Cervidae (deer), Giraffidae (giraffe and okapi), Antilocapridae (pronghorn), and Bovidae (cattle, goats, sheep, and antelope). Members of the Ruminantia suborder have a fore-stomach with four chambers. The nine extant species of chevrotain, also known as mouse deer and comprising the family Tragulidae, have four chambers, but the third is poorly developed. Chevrotains also have other features that are closer to non-ruminants such as pigs. They do not have horns or antlers, and like the pigs, they have four toes on each foot. The remaining ruminants belong to the suborder Tylopoda. Meaning "padded foot," this suborder contains the camel family, Camelidae. Included in Camelidae are camels (Camelus dromedarius and Camelus bactrianus), and the South American llamas (Lama glama), alpacas (Lama pacos or Vicugna pacos), guanacos (Lama guanicoe), and vicuñas (Vicugna vicugna). Although considered ruminants—any ungulate of the order Artiodactyla that chews its cud—camelids differ from those members of Ruminantia in several ways. They have a three-chambered rather than a four-chambered digestive tract; an upper lip that is split in two with each part separately mobile; an isolated incisor in the upper jaw; and, uniquely among mammals, elliptical red blood cells and a special type of antibodies lacking the light chain, besides the normal antibodies found in other species. The basic four chambers of the stomach in members of Ruminantia are the rumen, reticulum, omasum, and abomasum. Together, these compartments occupy about three-quarters of the abdominal cavity, filling almost all of the left side and extensive portions of the right (Bowen 2003). The first two chambers or the ruminant stomach, the rumen and the reticulum, while having different names, represent the same functional space, as digesta (or ingesta) can move back and forth between them. Together, these chambers are called the reticulorumen. In some respects, the reticulum can be viewed as a "cranioventral sac of the rumen" (Bowen 2003). The reticulum lies next the diaphragm and is connected to the rumen by a fold of tissue. The rumen is by far the largest of the fore-stomachs; it itself is divided by muscular pillars into the dorsal, ventral, caudodorsal, and caudoventral sacs (Bowen 2003). In these first two chambers, the food is mixed with saliva and separates into layers of solid and liquid material. Solids clump together to form the cud (or bolus). The cud is then regurgitated, chewed slowly to completely mix it with saliva and to break down the particle size. Fiber, especially cellulose and hemi-cellulose, is primarily broken down into the three volatile fatty acids, acetic acid, propionic acid, and butyric acid in these chambers by microbes (bacteria, protozoa, and fungi). Protein and non-structural carbohydrate (pectin, sugars, starches) are also fermented. The degraded digesta, which is now in the lower liquid part of the reticulorumen, then passes into the next chamber, the omasum. The spherical omasum is connected to the reticulum by a short tunnel. It is in the omasum where water and many of the inorganic mineral elements are absorbed into the blood stream (Bowen 2003). After this, the digesta is moved to the last chamber, the abomasum. 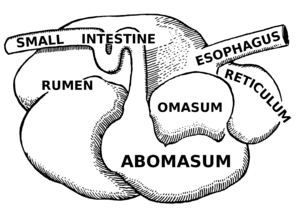 The abomasum is the direct equivalent of the monogastric stomach (for example that of the human or pig), to which it is very similar histologically (Bowen 2003), and digesta is digested here in much the same way. Digesta is finally moved into the small intestine, where the digestion and absorption of nutrients occurs. Microbes produced in the reticulorumen are also digested in the small intestine. Fermentation continues in the large intestine in the same way as in the reticulorumen. The fore-stomach anatomy of camelids is different, in having an omasum that is tubular and almost indistinct, and having a reticulum with areas of gland-like cells. For such a reason, camelids are sometimes referred to as "pseudoruminants" or as having "three stomach" instead of four (Bowen 2003). The fermentation in the ruminant digestive system depends on bacteria, protozoa, and fungi. Bowen (1998) notes that each milliliter of rumen content has roughly 10 to 50 billion bacteria, one million protozoa, and variable numbers of yeasts and fungi, almost all of which are anaeobes or faculative anaerobes, given that the environment of the rumen is anaerobic. There are a wide variety of bacteria, including those that are cellulolytic (digest cellulose), hemicellulolytic (digest hemicellulose), amylolytic (digest starch), and so forth. Protozoans (mainly ciliates) contribute substantially to fermentation, with experiments demonstrating that lambs and calves deprived of ruminal protozoa show poor growth rates, among other indicators of doing poorly (Bowen 1998). Almost all the glucose produced by the breaking down of cellulose and hemicellulose is used by microbes in the rumen, and as such ruminants usually absorb little glucose from the small intestine. Rather, ruminants' requirement for glucose (for brain function and lactation if appropriate) is made by the liver from propionate, one of the volatile fatty acids made in the rumen. In Abrahamic religions, a distinction between clean and unclean animals approximately falls according to whether the animal ruminates. The Law of Moses in the Bible allowed only the eating of animals that had split hooves and "that chew the cud" (Leviticus 11:6), a stipulation preserved to this day in the Kashrut. Bowen, R. 1998. Fermentation microbiology and ecology. Colorado State University. Retrieved December 24, 2008. Bowen, R. 2003. Digestive anatomy in ruminants. Colorado State University. Retrieved December 24, 2008. Bowen, R. 2006. Digestive physiology of herbivores. Colorado State University. Retrieved December 24, 2008. Nowak, R. M., and J. L. Paradiso. 1983. Walker's Mammals of the World, 4th edition. Baltimore: Johns Hopkins University Press. ISBN 0801825253. Van Soest, P. J. 1994. Nutritional Ecology of the Ruminant. Ithaca: Comstock Pub. ISBN 080142772X. This page was last modified on 25 December 2008, at 13:01.